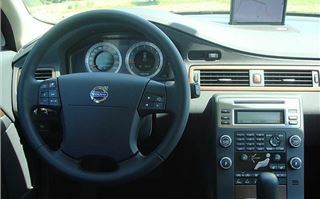 Have a crash in a new Volvo 2007 V70 and your chances of stepping out intact are better than in any other station wagon. There are now extra airbags in the seat squabs to protect your lower body in impacts from the side, while the front crumple zone is built from four different types of steel to absorb head-on impacts progressively, leaving the cabin intact. Even the rear bumper is of a new, buttressed design. There’s no safer estate to be in. It’s a bigger, heavier, stronger car than the previous V70, based on the new S80 floorpan rather than the narrower S60 floorpan of the previous V70. It isn’t as pretty, though. 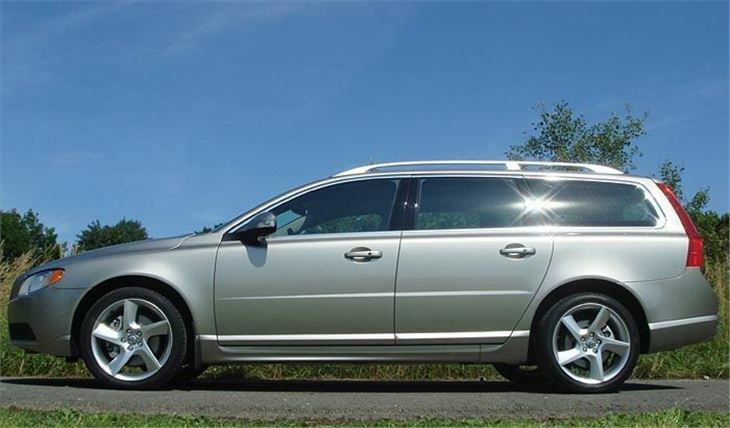 The old V70 was one of the best-looking estates you could by. The new one is handsome enough and doesn’t offend the eye, but doesn’t catch it either. 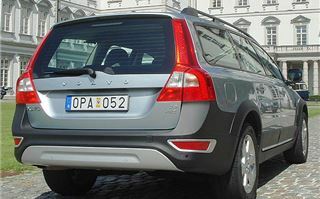 It actually looks better in XC70 four-wheel-drive guise with matt black bumpers and side protectors to ward off damage, and, thankfully, no matt black nose like the old XC70. 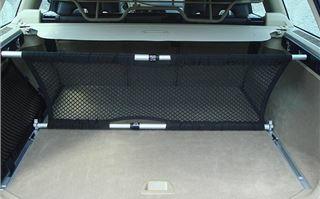 Tailgate access is now much better, which will please antique dealers, and cargo volume to window height is up 60 litres. The rear seat backs are split 40-20-40 to suit different passenger and cargo carrying requirements. There are optional built-in child seats that are so easy to pull out to two different heights, the child itself can do it. 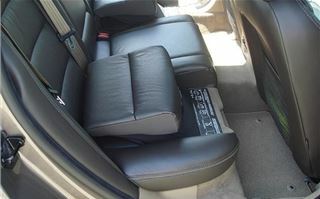 And if you don’t use them you can actually get three reasonable sized child seats across the back seat. 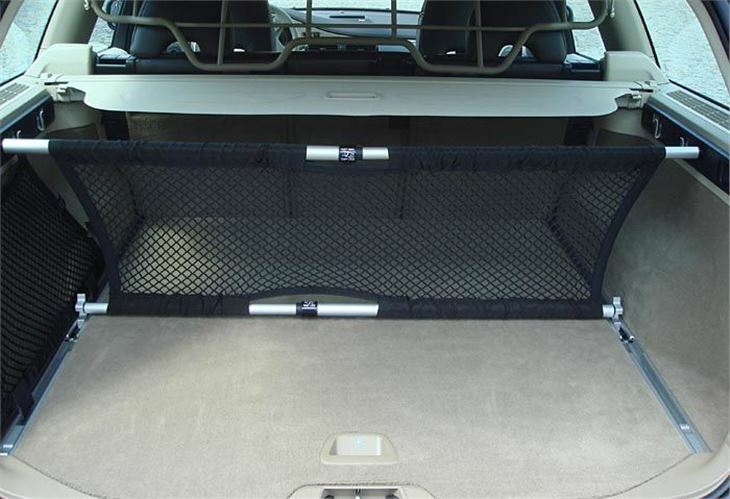 There are no plans to offer rear-facing child seats in the cargo area, which now has a clever system of cargo tie-downs and dividers, including a hammock to suit different needs and hooks for grocery bags. There are five engines in the first production, which can be ordered now for delivery September/October. Future plans include PSA/Ford’s 2.0-litre 136PS diesel as an entry-level powerplant, but that is unlikely to arrive before next year. We drove a four-wheel-drive V70 T6 with the 285PS twin-scroll-turbo 3.2 I6 and a 185PS D5, both with 6-speed Geartronic autoboxes. 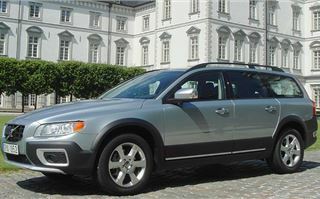 Then the XC70, first with the 185PS D5 and finally with the 238PS non-turbo 3.2 I6. The 6-speed autobox is a bit slurry, prone to changing gear half way through a bend and with only a back-to-front Tiptronic lever to control it (no paddleshift), it’s no fun to drive quickly on twisty roads. Not that this will matter to the majority of owners. Actually, it’s very like the S80 it’s based on. The 285PS I6 turbo goes as well as you would expect it to. On a short stretch of traffic-free, de-restricted autobahn we saw 130 very easily. But that’s not really the point of a Volvo estate and most buyers are likely to go for the D5. Volvo offers improvements including an ‘active chassis’ in the SE Sport using the three-button technology from the new Mondeo. That stiffens it up, but to really find out how well it can handle I’d like to have tried the 6-speed manual. One goodie that works well is the adaptive cruise control. It’s very simple to work out how to use: just press a button on the steering wheel, then the cruise control button and your speed is set. You can then adjust it in 5mph increments and also decide on how far you want the system to keep you from the car in front. The only downside is that the sensor has to sit in the grille behind an ugly plastic cover that looks like a spectacle case and looks like a spot on the car’s face. 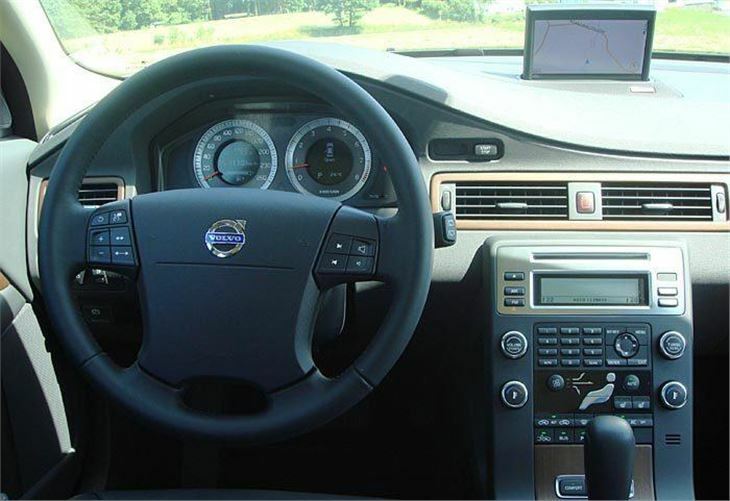 The system includes collision danger warning to alert the driver of impending disaster, and the optional BLIS blindspot alert has been beefed up with a larger warning light to alert you for anything sitting on your shoulder. The version I liked best was the XC90 D5. This runs a little bit higher off the road than the old XC90 with better approach, ramp and departure angles and sits on excellent 235/55 R17 Pirelli Scorpion tyres. On the road it’s okay rather then an excellent handler and the tyres are commendably quiet. Off-road it’s very good indeed, now fitted with Land Rover’s Hill Descent Control that gets you down slippery slopes without locking up and sliding into the nearest tree. It was good to see Volvo brave enough to send us on the offroad route in the same cars we had been driving down the German Autobahn. The XC70 D5 is good news for horse owners and caravanners too, as both the manual and the automatic will restart pulling 2,100kg up a 12% slope, and the substantial vehicle weight of 1,868 to 1,884kg gives a caravan towing weight of at least 1,588kg according to the Caravan Club’s sensible 85% rule. 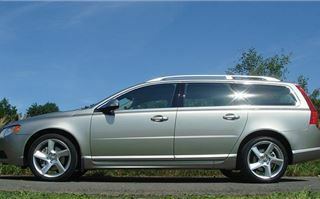 V70 price structure is simple with just five engines initially and three levels of trim. 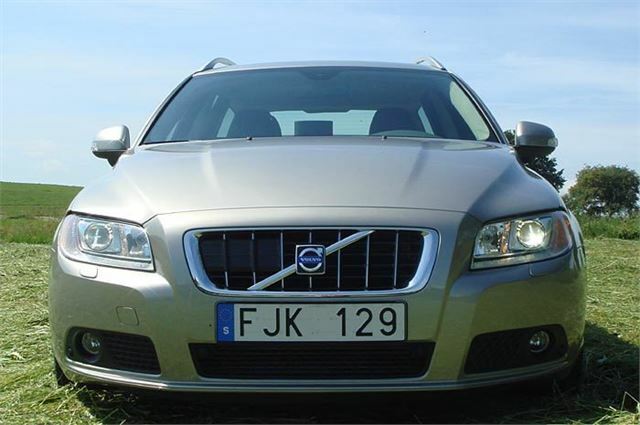 Unlike the S80, there is a turbocharged 285PS 3.2 I6 rather than a 4.4 litre 315PS V8. Some versions are actually cheaper than the equivalent S80. The four-wheel drive XC70 is around £3,000 more than the V70, but comes with standard leather seats that cost £1,200 on a V70. XC 70s only come with the 238PS 3.2 I6 or the 185PS D5. No smaller engines or T6. Already CAP Monitor is predicting higher residual values for the V70 and XC70 than the equivalent Audi A6 Avant, BMW 5-Series Touring and Mercedes E Class estate (though no mention was made of the Subaru Legacy and Outback). 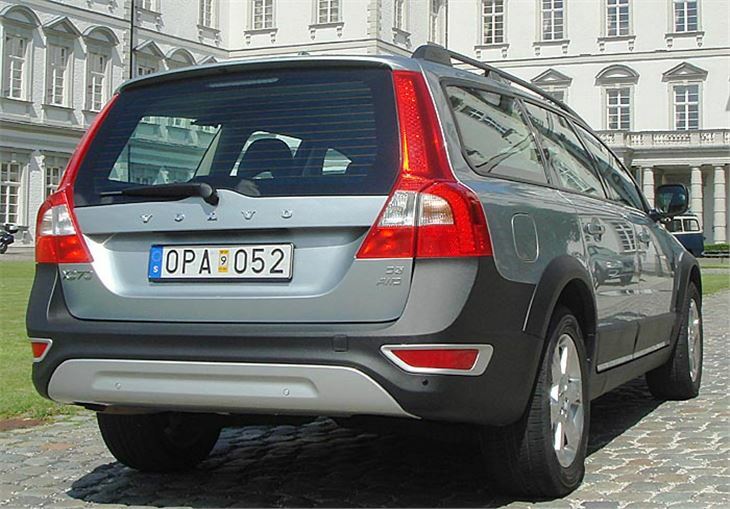 The V70 and XC70 carry more volume and squarer loads than the A6 Avant or 5-Series Touring. But are neither as big, more as capacious (nor as expensive) as the Mercedes E Class estate. Volvo’s niche of buyers is already carved, and they won’t be disappointed with the new car.